o Agility Ladder: Build strength and agility by using this portable ladder to sharpen your focus and your form. o Speed Rope: Improve your foot speed and endurance with this ultimate training secret. 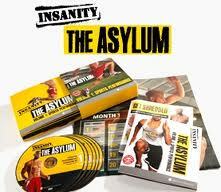 o ASYLUM Workout Calendar: Check it each day to cross-train like a professional athlete. o Guide Playbook: Map out your 30-day transformation with this smart step-by-step guide. o Eat to Win Nutrition Plan: Follow meals and tips used by Shaun T and you’ll be ready for game day—every day. o Overtime: Add this 15-minute monster to any Asylum workout to see if you’ve still got game.